For other uses, see Myra (disambiguation). Myra (Ancient Greek: Μύρα, Mýra) was an ancient Greek, then Roman Greek, then Byzantine Greek, then Ottoman Greek town in Lycia, which became the small Turkish town of Kale, renamed Demre in 2005, in the present-day Antalya Province of Turkey. In 1923 its Greek inhabitants had been required to leave by the Population exchange between Greece and Turkey, at which time its church was finally abandoned. It was founded on the river Myros (Ancient Greek: Μύρος; Turkish: Demre Çay), in the fertile alluvial plain between Alaca Dağ, the Massikytos range and the Aegean Sea. The theatre of Myra, with the rock-cut tombs of the ancient Lycian necropolis on the cliff in the background. Although some scholars equate Myra with the town Mira in Arzawa, there is no proof for the connection. There is no substantiated written reference for Myra before it was listed as a member of the Lycian league (168 BC – AD 43); according to Strabo (14:665) it was one of the largest towns of the alliance. The ancient Greek citizens worshipped Artemis Eleutheria, who was the protective goddess of the town. Zeus, Athena and Tyche were venerated as well. In the Roman period Myra formed a part of the Koine Greek speaking world that rapidly embraced Christianity. One of its early Greek bishops was Saint Nicholas. The ruins of the Lycian and Roman town are mostly covered by alluvial silts. The Acropolis on the Demre-plateau, the Roman theatre and the Roman baths (eski hamam) have been partly excavated. The semi-circular theater was destroyed in an earthquake in 141, but rebuilt afterwards. There are two necropoleis of Lycian rock-cut tombs in the form of temple fronts carved into the vertical faces of cliffs at Myra: the river necropolis and the ocean necropolis. The ocean necropolis is just northwest of the theater. The best-known tomb in the river necropolis, 1.5 km (0.93 mi) up the Demre Cayi from the theater, is the "Lion's tomb", also called the "Painted Tomb". When the traveller Charles Fellows saw the tombs in 1840 he found them still colorfully painted red, yellow and blue. Lycian tomb relief at Myra, 4th century BC. Andriake was the harbour of Myra in classical times, but silted up later on. The main structure there surviving to the present day is a granary (horrea) built during the reign of the Roman emperor Hadrian (117–138 AD). Beside this granary is a large heap of Murex shells, evidence that Andriake had an ongoing operation for the production of purple dye. Excavations have been carried out at Andriake since 2009. The granary was turned into the Museum of Lycian Civilizations. The granary has seven rooms and measures 56 meters long and 32 meters wide. Artifacts found during the excavations in the Lycian League were placed in the museum. The structures in the Harbor Bazaar as well as the agora, synagogue and a six-meter deep, 24-meter long and 12-meter wide cistern were restored. A 16-meter long Roman-era boat, a crane and a cargo car were placed in front of the museum. The author of the Acts of the Apostles (probably Luke the Evangelist) and Paul the Apostle changed ships here during their journey from Caesarea to Rome for Paul's trial, arriving in a coastal trading vessel and changing to a sea-faring skiff secured by the Roman centurion responsible for Paul's transportation to Rome. The Acta Pauli probably testify to the existence of a Christian community at Myra in the 2nd century. Lequien opens his list of the bishops of this city with St. Nicander, martyred under Domitian in 95, who, according to the Greek Menologion, was ordained bishop by Saint Titus. In 325, Lycia again became a Roman province distinct from that of Pamphylia, with Myra as its capital. Ecclesiastically, it thus became the metropolitan see of the province. The bishop of Myra at that time was Saint Nicholas. The 6th-century Index of Theodorus Lector is the first document that lists him among the fathers of the First Council of Nicaea in 325. Many other bishops of Myra are named in extant documents, including Petrus, the author of theological works in defence of the Council of Chalcedon quoted by Saint Sophronius of Jerusalem and by Photius (Bibliotheca, Codex 23). Theodorus and Nicolaus were both at the Second Council of Nicaea in 787, the former recanting his previous iconoclast position, the latter being the Catholic bishop whom the iconoclasts had expelled. The Notitia Episcopatuum of Pseudo-Epiphanius, composed in about 640 under the Byzantine Emperor Heraclius, reports that Myra at that time had 36 suffragan sees. The early 10th-century Notitia attributed to Emperor Leo VI the Wise lists only 33. Myra is today listed by the Catholic Church as a titular see both in general and as a bishopric of the Melkite Catholic Church in particular. While Latin bishops are no longer appointed to this Eastern titular see, Melkite bishops are. Saint Nicholas of Myra Saves Three Innocents from Death (oil painting by Ilya Repin, 1888, State Russian Museum). After a siege in 809, Myra fell to Abbasid troops under Caliph Harun al-Rashid. Early in the reign of Alexius I Comnenus (ruled between 1081 and 1118), Myra was again overtaken by Islamic invaders, this time the Seljuk Turks. In the confusion, sailors from Bari in Italy seized the relics of Saint Nicholas, over the objections of the monks caring for them, and spirited the remains away to Bari, where they arrived on May 9, 1087, and soon brought that city visitors making pilgrimage to Saint Nicholas. 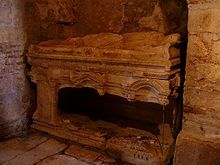 The original tomb of St. Nicholas at the basilica in Myra. The earliest church of St. Nicholas at Myra was built by the Eastern Roman (Byzantine) Empire in the 6th century. The present-day church was constructed mainly from the 8th century onward for the city's Byzantine Greek inhabitants; a Greek Orthodox monastery was added in the second half of the 11th century. In 1863, Imperor Alexander II of Russia purchased the building and began restoration, but the work was never completed. In 1923 the church was abandoned when the city's Christian inhabitants were forced to leave for Greece by the Population exchange between Greece and Turkey. In 1963 the eastern and southern sides of the church were excavated. In 1968 the former confessio (tomb) of St. Nicholas was roofed over. The church is currently undergoing restoration. In 2007 the Turkish Ministry of Culture gave permission for the Divine Liturgy to be celebrated in the church for the first time in centuries. On 6 December 2011 Metropolitan Chrysostomos, who has the title of Myra, accordingly officiated. Archaeologists first detected the ancient city in 2009 using ground-penetrating radar that revealed anomalies whose shape and size suggested walls and buildings. Over the next two years they excavated a small, stunning 13th-century chapel sealed in an uncanny state of preservation. Carved out of one wall is a cross that, when sunlit, beams its shape onto the altar. ^ Fant, Clyde E.; Reddish, Mitchell G. (2003). A Guide to Biblical Sites in Greece and Turkey. Oxford University Press. p. 485. ISBN 9780199881451. ^ Gerhard Forstenpointer, et al., "Purple-Dye Production in Lycia – Results of an Archaeozoological Field Survey in Andriake (South-west Turkey)." Oxford Journal of Archaeology 26, 2 (2007):201–214. Wikimedia Commons has media related to Myra.